Coccyx pain sufferers often find driving particularly painful. There are several reasons for this. Car seats force you to lean back, with your knees higher than your bottom, so that all of your weight is put around your coccyx. Then there are bumps, corners, and the fact that you have to push with your legs to drive. So your coccyx is under pressure, hammered from below, and pulled around. 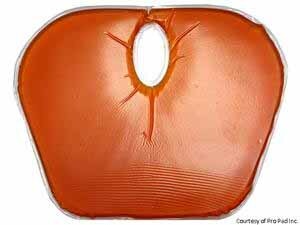 If you have to drive, try a coccyx cushion. The type that is wedge shaped will help to make the seat more level. If using a cushion raises you too high up, or puts the curve of the back of the seat in an uncomfortable position, you could modify the seat. Try tilting the back of the seat as far forward as it will go. It's a strange position to drive in, but it takes pressure off the back of the coccyx and helps some people. Alternatively, you can make a foam cushion to cover the back of the seat, but which ends about 15 cm (6 inches) above the bottom of the seat. Again, this takes the pressure off the back of your bottom. A car with automatic transmission is easier for most sufferers. Lisa writes: You may find that you can tolerate driving for longer if you adjust your seating position so that you're as far back as you can go but still safely depress the clutch pedal. I've found that I can do up to 45 minutes driving, but can only manage about 10 minutes as a passenger before my bum starts complaining. I (Jon Miles) found that after my coccyx operation, the most uncomfortable position for me was leaning back in a seat. Unfortunately modern cars mostly make you lean back, often with your feet nearly as high as your bottom. I eventually found my solution with a modified Suzuki Wagon R+, a small town car with upright seats and plenty of headroom. You can see my modified car here. If possible, avoid driving - get someone else to drive instead, join a car pool, use taxis (lie down in the back), buses or trains, walk, move closer to the shops. If someone else is driving you, lie down on the back seat, or wind the front passenger seat nearly flat. It doesn't have to go completely flat before it takes the pressure off the coccyx. In this position the seat belt won't be much good, so make sure you have a safe driver. Some people have gone so far as to get a van modified with a bed in the back. Sheer luxury! See Angie Gray's travel tips. Anonymous writes: My over-90 mother has a 'disintegrating coccyx'. Driving her even for 10 minutes caused her pain. We experimented with a variety of cushions and changed the angle of the seat back. What seemed to give us progress was when I slid my hand behind her back to find out where there were gaps between the seat back and mother's back, and we just filled them up. We ended up with the seat back slightly reclined, plus three totally unmatched cushions side by side up the seat back, that supported her back all the way up, plus her head. Yes, it took a couple of minutes to get her installed. This worked very well, and was well proven when one day we visited people at three locations and spent about six hours travelling in the car and mother was reluctant to get out of it at the end of the trip. After each visit she had commented how uncomfortable the people's furniture was and how she was pleased to be back in the car. What really helped was that she could relax fully: a great deal of the weight of her upper body was supported by the seat back, and her head was supported: none of the muscles in her back needed to be tense. Travelling by air, if you can afford first class then you will be able to stand or lie. If not, then take any opportunity to stand. I go to the toilet as soon as the aisle is free, and stand outside it for half an hour. For air travel, here is Linsey's travel tip: When you have to take an airplane trip, lean all the way over during ascent. This keeps the coccyx from being compressed from the pressure of rising. Lying down in the aisle would be best but the airlines won't go for it. At any rate, that makes flying tolerable for me and oddly enough, if you hold a book in your hands (you'll need to--ascent takes a long time), people never comment. But if they did comment, they might call it "kissing your a** good bye." :) When the pilot announces that the plane has reached it's cruising altitude, sit up and notice how much better that feels! It's easy to stand on trains, if your feet don't hurt too much. If you are going to sit, get a seat with a table and lean across the table. Before I had my operation to remove my coccyx, I used to kneel on the seats of trains, if they weren't too crowded. I used to find a seat where I could kneel up, leaning my front against the back of the seat, and look over the top of the seat, resting my arms on the top. I didn't do it if there's someone in the seat behind, because it would be rude to hang over them. Most motorcycles make you lean forward, which may be enough for some people to travel in comfort. But many people will still get pressure on the tailbone. There is a website, diymotorcycleseat.com, describing how you can modify a motorbike seat to your own requirements to make it comfortable. There is also a motorcycle seat insert with a "comfort channel that relieves pressure on the rider's tailbone" - see www.motorcycle-usa.com. It is made by www.thepropad.com. Here's a pain-free way to travel that will recommend itself to all coccydynia sufferers.